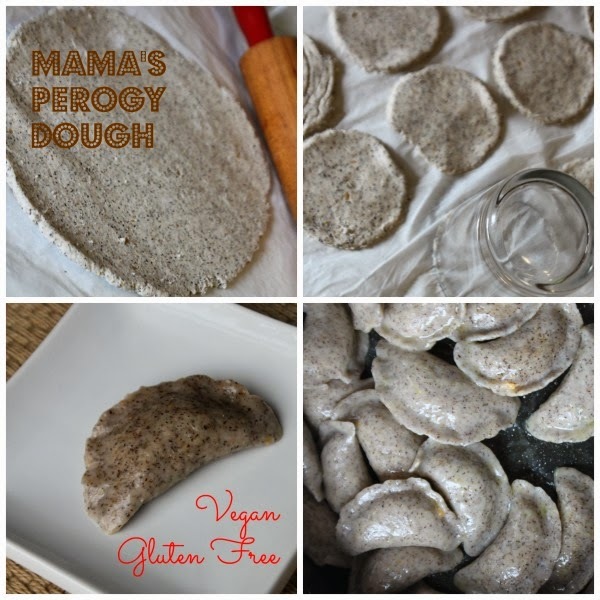 MamaEatsClean: Gluten Free Vegan Perogy Dough - Success on my second try..........Grandma would be so proud or horrified? Gluten Free Vegan Perogy Dough - Success on my second try..........Grandma would be so proud or horrified? I made perogies this weekend. Well, the first batch I did try and make grain free so I could eat them. They didn't work out so well. So I tried another batch. This time gluten and dairy free. For my daughter. Growing up, perogies were a staple in my house. Standard fare. Refined white flour dough filled with white potatoes, cheese whiz and loaded with salt and butter. And dripping with more butter on top. And then a generous helping of sour cream. Well, that chapter of my (our) life is closed. But I am not ready to completely close the door on perogies. Mainly because my kids LOVE them. And they are a really great food that you can make in large quantities, freeze and pull them out for a quick dinner or side dish. And they aren't actually hard to make. If you have a rolling pin and some time. So with my rolling pin and some time, I set out to make a second batch of gluten-free, vegan perogy dough. No wheat, no eggs and no butter or dairy. And guess what. It worked. And the kids loved them. When the first batch survived being boiled without splitting apart I exclaimed "My grandma would be so proud". Proud of the fact that I spent my Saturday afternoon pinching perogies just like she taught me. But hubby had to add in "or horified". Because I will be the first to admit these do not taste exactly like the original. But they are CLEAN. Healthy. I can feel good feeding them to my family. And they like them. So as I like to say "revise your expectations and then prepare to be impressed". I stuffed mine with a mixture of pureed sweet potato, mashed cauliflower and spices. Let your imagination be your guide. Next Saturday I'm going to make a meat stuffing and then top them with marinara sauce for some "gluten-free ravioli". So just remember...........there is life after wheat. Life without belly aches. First make your flax eggs. Add 1/4 cup warm water to the ground flax. I buy whole golden flax, grind it in my coffee grinder and keep in fresh and ready to go in the fridge. Combine well and let stand about 5 to 10 minutes before using. Combine the flour in salt in a mixing bowl. Add water, flax egg and oil. I used my hands to mix together (really well) until it formed a ball. I kneaded it until it was fully combined. Don't over do it. Once all the flour is absorbed/mixed in stop. I cut the ball in half and wrapped half with saran wrap and put aside. I place the other half on a large piece of parchment paper. I rolled it out using a large rolling pin until it was about 1/8 inch thickness (or a bit more). Then I cut out circles using a glass (about 3 inch in diameter) turned upside down. Next put about 1/2 tbsp of filling in each circle, fold in half and pinch the ends together. Fill a large pot with water and a dash of salt. Bring to a low boil. Add 1 dozen perogies at a time. Make sure its not boiling too hard or they could break open. Once the perogies float to the top let them boil for an additional 2 minutes and then remove from water and place in a roaster with olive oil. Shake the roaster to coat with oil to prevent perogies from sticking together. Serve as is or freeze individually (with parchment paper in between) and reheat by frying or boiling again.